On a warm sunny evening there is no better place than being ouside. Just a short walk from St Paul’s gets us to the playing fields and woods at Dixie Woods. 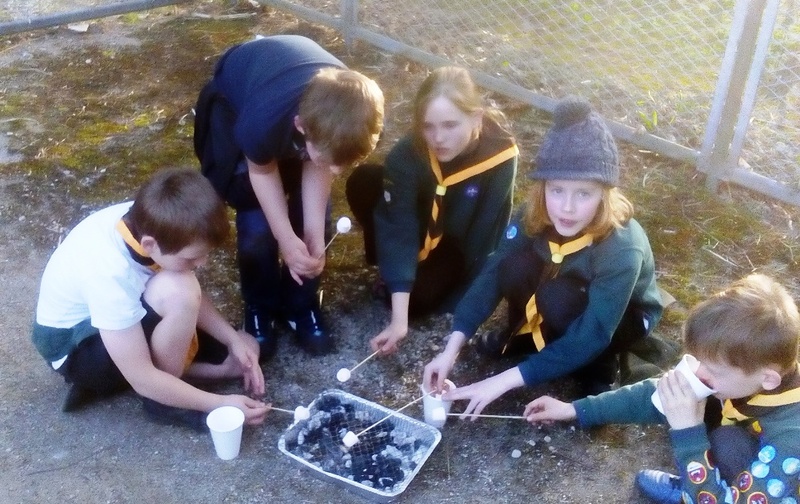 Tonight’s meeting was planned and carried out by Cubs from the Green Six – run around in the woods playing hide and seek – and cooking s’mores. For those of you who don’t know what s’mores are, they are sweet and delicious – not sure where they originated from, but I first came across them when I was in the States 10 years ago. They are very simple to make – toast a marshmallow and when its about to melt, slap it between two chocolate biscuits and then? Eat it of course. In the States they tend to use plain biscuits and put some thin strips of chocolate in with the toasted marshmallow. It appears that they have been around since at least 1925 as an American newspaper reports Scouts as making them on camp.